On October 19, 2001, a boat laden with asylum seekers en route to Australia from Indonesia sank, killing 353 people. Despite ever more evidence to the contrary, the Australian government claims it has no responsibility regarding the deaths. Whistleblower Tony Kevin stepped forward to prove them wrong. In this article, he explains how the battle for truth about SIEV X is going. 30 October 2005: Tony Kevin's SIEV X 4th Anniversary Speech - "All of us who care - and there are many of us - can use our rights of free speech and free enquiry, and free debate on the internet, to keep the questions about SIEV X alive." 19 October 2005: The SIEV X Landmark of Conscience - "When the evening ended, senators, members of the ACT assembly, officials from museums and planning authorities, and most importantly the refugees themselves, all expressed the same view. You must build it." 18 October 2005: SIEV X four years on: still drowning in spin - Like all disasters in the treatment of refugees and asylum seekers in Australia, the SIEV X affair will not finish until all questions are answered, all documents held in secret by the Howard government are released, and all those who know things they have not told the Australian people, have been subpoenaed to testify and also tell the full and unabbreviated truth about the SIEV X disaster. 15 March 2004: Senator Jacinta Collins and A Certain Maritime Incident - With the tabling in the Senate of the Report of the Senate Select Committee on A Certain Maritime Incident (23 Oct 2002), Senator Collins contributed with two important speeches. "The pattern of behaviour record that this government refers to, was provided to the government on request by the government in a fashion designed by the government to suit the government." 15 March 2004: Concluding Statements, A Certain Maritime Incident - The reality of the inquiry into the children overboard affair is that at best there are inconsistencies and contradictions in the evidence given before the Senate Inquiry by the most senior of Defence and PMC officials. At worst there are fundamental omittances, half-truths, untruths and cover-ups. 20 February 2004: The SIEV X National Memorial Project - The SIEV X National Memorial Project is an Australia-wide Young People's Art Collaboration, to design and build a memorial to the people of SIEV X, on the shores of Lake Burley Griffin in Canberra, the national capital. 2 December 2003: The Australian Labor Party and SIEV X - An open letter to Labor's new leader Mark Latham, by Tony Kevin, SIEVX whistleblower. "Do you support the series of passed Senate motions calling for a full powers independent judicial inquiry into the sinking of SIEV X ? If you become Prime Minister, will you undertake to implement this Senate demand?" 24 November 2003: The Melville Island incident: Australia's New Low - UNHCR regional representative Michel Gaubadan called it "a new low" for Australian refugee treatment. Fourteen Kurdish asylum seekers sought refuge in Australia. In an extraordinary move the Howard government retrospectively excised thousands of islands, including Melville Island - but Senator Andrew Bartlett intervenes. 22 May 2003: SIEV X and the DFAT cable: The conspiracy of silence - That such a large number of government officials .... were willing to co-operate in withholding the detailed, highly relevant information in the DFAT cable leaves little doubt that we are still far from the full truth concerning the sinking of SIEVX. 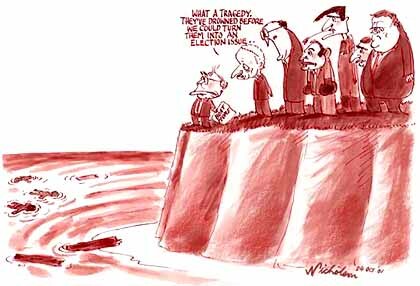 20 May 2003: An interview with 2003 Whistleblower of the Year Tony Kevin - Former Australian diplomat Tony Kevin is convinced the SIEV X asylum-seeker tragedy will become the Howard Government's Watergate. "...the public story was not true, it did not hang together..."
The story of SIEV X has become one of the shameful government secrets that everyone around federal parliament house "knows", but that major parties and media don't want to say too much about publicly. Don't rock the boat is the prevailing mainstream mood: "forget SIEV X". (NOTE: Click on the map image to show its large version). I succeeded in getting the sinking of SIEV X discussed by the Senate "children overboard" inquiry in March 2002. The inquiry got down to serious questioning about it in April. Shortly thereafter, Marg Hutton opened her web site. Over the next six months, the CMI questioned many official witnesses and received much written documentary evidence from departments and agencies. SIEV X replaced "children overboard" as the main issue before the CMI inquiry. An initial clumsy cover-up, claiming that the defence force's "border protection" Operation Relex, in the area at the time of the sinking, knew nothing about SIEV X until Australian search and rescue authorities reported it missing, fell apart under the weight of its own obvious contradictions. The first SIEV X whistleblower was Coastwatch head Admiral Marcus Bonser. He was candid in front of the inquiry, where he confirmed that the boat had been under Australian surveillance for some time. His testimony forced the Royal Australian Navy's (RAN) Admiral Geoff Smith to reverse his untrue sworn testimony in a "letter of clarification" to the inquiry. Media and political interest in the story built through May and June of that year. A more subtle cover-up was orchestrated by the defence minister Robert Hill and his advisers, starting in late June 2002. It soothed public concern through leaks to the Australian of purported evidence. Finally it sent to the inquiry what Hill claimed was a complete and authoritative review of all intelligence material on SIEV X available to the Australian Defence Forces. This was known as the "Gates Review", after its author, RAN Admiral Raydon Gates. Gates, never allowed by Hill to testify in person, got Operation Relex off the hook. His review appeared to answer questions as to why Operation Relex aircraft and ships had failed to detect SIEV X's entry - or its sinking - in its operation zone. The CMI report accepted by the Senate in October 2002 basically exonerated the ADF on the basis of the Gates Review. From July 2002, Senator John Faulkner (Labor's leader in the Senate and a member of the inquiry) asked searching questions about the conduct of the Australian Federal Police's (AFP) covert people smuggling disruption program (PSDP) in Indonesia. (This program involves Australian government employees in people smuggling). He clearly had access to an undeclared whistleblower. His suspicions hardened as his questions went unanswered, and as Channel Nine's Sunday program revealed the criminal activities of an AFP undercover people smuggler and informant in Indonesia, Kevin Enniss, who also sabotaged his boats. This culminated in Faulkner's four extraordinary days of accusatory questions about the PSDP in the Senate in September 2002, climaxing in his famous warning that AFP and the Australian Security Intelligence Service secret operational protocols in Indonesia "were never intended to be licences to kill". The CMI inquiry's final report was accepted by the Senate in October 2002. It found that it was impossible to establish where SIEV X had sunk. It accepted the Gates Review evidence, but noted that large questions were outstanding about the PSDP and SIEV X. The report called for a independent judicial enquiry into these matters; a demand ignored by the government. Two Senate motions were passed in December 2002, sponsored by all opposition parties, calling for an independent judicial inquiry into SIEV X and the PSDP, and for bringing to justice Abu Quassey, the organiser of the fatal SIEV X trip, then serving a minor sentence in Indonesia. The government ignored these motions. The obvious lack of interest (from December 2002 onwards) by the AFP in pursuing Abu Quassey's deportation from Indonesia to Australia for people smuggling, and his police-protected return to his native Egypt in April 2003, further fuelled suspicions of Australian official security agencies' connivance in the sheltering of this key figure in the SIEV X disruption project story. On February 4, 2003, a classified reporting cable sent by the Australian embassy in Jakarta four days after the boat sank was finally released. Its contents discredited much of the official evidence given to the CMI inquiry. A distressed ALP Senator Peter Cook, who had chaired the CMI inquiry, protested the very next day in the Senate that he now realised officials had lied to the inquiry. His remarkable complaint went unreported. No government action was taken. Dark Victory, a book by David Marr and Marian Wilkinson, came out in March 2003. It exposed the cruelty and deviousness of Operation Relex, although not doing justice to the mounting evidence of a government cover-up around the sinking of SIEV X. Like Senator Faulkner, however, it left serious questions hanging over the PSDP and possible Australian official knowledge of sabotage of refugee boats. Marg Hutton published a powerful detailed analysis in May 2003, "SIEV X and the DFAT cable: the conspiracy of silence". She showed conclusively how government agencies had colluded in the Gates Review to mislead the Senate inquiry over where SIEV X sank, and on other key facts brought to light by the released Jakarta cable. I published an article in the Canberra Times in July, 2003, showing two new maps charted by sievx.com onto the template of the ADF maps presented in the Gates Review. The first map charted the evidence of all existing public data as to where SIEV X sank. Four separate pieces of data located the same small area of ocean in the heart of the Operation Relex surveillance zone, about 50-60 miles south of Indonesia on a direct route from Sunda Strait to Christmas Island. The second sievx.com map plotted this location against data of claimed Royal Australian Air Force (RAAF) flights and recorded detections of boats in the Relex zone on the morning that survivors were being picked up over four hours by two Indonesian fishing boats. According to the Gates Review, none of these boats were detected by the ADF. Yet an RAAF Orion had made three surveillance passes overhead in instrument detection range, in reportedly normal data collection conditions, while the boats were there. This data had simply been removed. There were other inconsistencies in the RAAF maps as they were presented in the Gates Review. It seems these maps had "doctored" the real RAAF flight path and detection data records. There was no political response and no media follow-up to this analysis. In October 2003, the Senate passed two more motions sponsored by Democrat Senator Andrew Bartlett and Green Senator Bob Bob Brown, with Labor support. They condemned the government's ineffective pursuit of Abu Quassey; called on the AFP to release the names of the dead; expressed the firm view that SIEV X had sunk in the Australian border protection zone; called for permanent residence for SIEV X survivors and their close families in Australia; and called again for a full powers independent judicial inquiry into the sinking of SIEV X and the PSDP. The government ignored these motions. Alexander Downer on ABC Radio's AM in December dismissed the four Senate motions in 2002-2003 as "just a political stunt" based on Tony Kevin's "crackpot theories". No-one challenged Downer's remarks. Quassey was tried in his native Egypt - a semi-secret trial in a national security court, based on manifestly inadequate charges of people smuggling and involvement in accidental death. He was found guilty in December 2003. He got seven years - about one week for each death. He may still appeal or have this sentence quietly reduced or waived. The AFP provided all the evidence for the Egyptian prosecution - six boxes of files. We have no knowledge of what was in or left out of that evidence. The Australian Embassy observed the trial closely. There were no live witnesses, although there are some 78 SIEV X survivors scattered around the world who could have testified. There is almost no possibility now that Quassey will ever be tried or be available to give witness evidence on SIEV X in Australia. Questions about SIEV X in senate estimates committees throughout 2003 met with increasingly brazen resistance from official witnesses, secure in their knowledge that they were expected by their government ministers to obstruct and conceal truth, and knowing that their careers would be at risk if they did not do so. In these responses, officials are no longer even pretending to try to explain the unbelievable. The claims are simply asserted on a truculent, take-it-or-leave-it basis. Ministers and official witnesses know that hardly anyone is listening. Things previously admitted are now being denied as the official story shifts. Blatant inconsistencies are accumulating. Disheartened senators are asking fewer and fewer estimates questions. There are official denials now of the well-attested claim that photos of SIEV X were shown by AFP to survivors. Implausible official claims continue that one survivor was the sole source of all the highly detailed boat and passenger information in the Jakarta cable. The AFP continues to refuse to make public the names of the dead or survivors. No official action was ever taken to review the sievx.com data that indicates SIEV X sank in Operation Relex-covered waters and that RAAF surveillance flight data given to the Senate in 2002 had been falsified. The official position remains that where the boat sank is unknown and unknowable. The Australian people smuggling disruption program continues but now in subtler, less lethal forms. At the moment, people smuggling is in abeyance, but government ministers regularly warn that it could resume at any time. Indeed it could, because it seems that Australian national security agencies now have covert indirect control of this trade through their Indonesian police links and undercover disruption agents. If true, this would mean Canberra can commission whatever people-smuggling scenario it wants to create at any particular time. The boat Minasa Bone, that landed at Melville Island in December 2003 with 14 Kurds on board, bears tell-tale signs of a made-to-order Australian-organised covert disruption operation. The boat reached Northern Australia - a long voyage - with no admitted Australian detection or attempt to intercept it. The boat landed at a remote and conveniently excisable island, when it could have as easily sailed directly into Darwin. Australian exclusion zones were at once proclaimed - the Kurds could not legally claim asylum, and no one could access them to witness events. Asylum claims were made, ignored, and it was later denied that they had been made. The boat was secretly towed back to Indonesia. The boat and crew promptly disappeared. Weeks later, as questions mounted, an alleged people smuggler living in Sydney, kebab-shop-owner Ali Cetin, was produced as a diversionary suspect. No charges were laid, but Cetin suffered trial by media. Finally, there was media speculation that charges might be laid and that some former passengers now back in Turkey might testify in Australia. We shall see. Possibly Cetin became criminally involved, or possibly he was a "patsy" cleverly set up in a frame. Either way, the Minasa Bone voyage bears many marks of a successful PSDP sting. There is now a program of four people smuggling trials underway in Australia, including one SIEV X-related trial in Brisbane due to start in April 2004 - Khaled Daoed, who was Abu Quassey's bookkeeper. Daoed may have had no knowledge at the time he sold tickets to passengers that he was involved in a life-threatening sabotage operation. Yet he is now likely to "take the fall" under an expected heavy Australian sentence as a people smuggler. Because he is only charged with people smuggling, it seems that no evidence other than that he sold tickets (easily obtainable from some SIEV X survivors in Australia) will be admissible in court. What won't be admissible is evidence of covert Australian "disruption" of people smuggling. This trial and expected heavy sentence will thereby "lock in" the official cover-up of SIEV X, unless a miracle happens. I forecast that the official line after Daoed's expected conviction will be that Quassey and Daoed and other people smugglers are in jail, the boats have stopped coming, so what more can the Senate want? The government will argue for closure of the Senate's SIEV X concerns. How will opposition parties in the Senate respond in 2004, the third anniversary year of 353 deaths on SIEV X? Will they stick to their guns? Clearly, Australia's systems of justice and accountability just have not worked in the case of SIEV X. At every turn in the story, determined efforts to open up the SIEV X case to real expert judicial inquiry have been blocked by insurmountable legal walls - issues of the case lying outside Australian geographical or personal jurisdiction, and of non-applicability of Australia's criminal law to whatever happened. Essentially, Australia's overworked human rights lawyers have stayed away from the story, waiting for a whistleblower to give it a real "hook". So the Senate has been left to carry the issue alone. Were it not for the Senate's heroic persistence in asking questions, the SIEV X story would have run into the sand long ago as a public issue. We will not give up now. We will keep on talking publicly about SIEV X and asking questions about it. In that way, the truth will out, new whistleblowers will come forward over time, and the guilty will finally be held to account. This is a major story that is a long way from over.